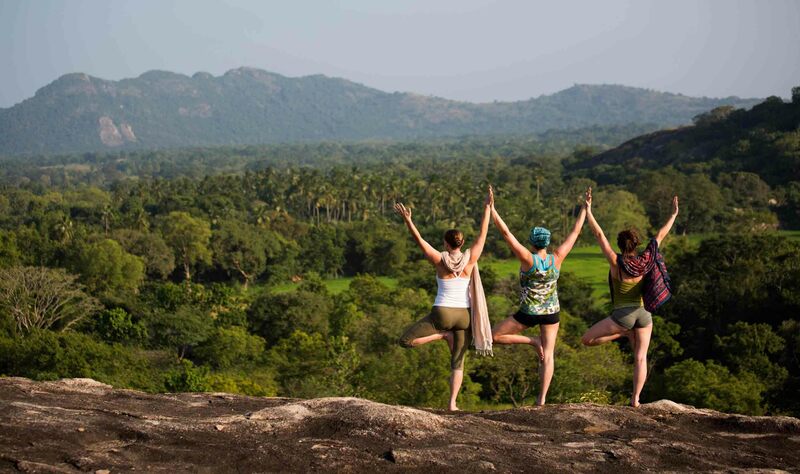 Submerged in the jungle heartland of Sri Lanka, Ulpotha is so remote that, by the time you bump your way down the dirt drive (three long hours from the airport), you could be forgiven for doubting its existence. You soon discover it is most definitely mud-between-the toes real. Living with nature is what the brochure said it was all about, and in Ulpotha they take that literally. It takes a while to get used to the lack of electricity and hot water, not to mention the absence of solid doors to lock out the inevitable bugs and jungle sounds. But by the end of the first day, this rusticity seems like paradise. Perhaps this is due to the allure of diving through lotus leaves into Ulpotha’s glorious mountain lake, or showering in waterfalls, or making your barefoot way back to your mud hut in the sultry night, along a trail through paddy-fields that is illuminated by a multitude of glow-worms and oil lamps. Meals are taken in the ambalama, a saffron-coloured, open-sided pavilion where dinner is heralded by the ceremonial arrival and unrolling of a large square woven mat. Dish after dish appears, carried from the kitchen by an entire family in procession, from the eight-year-old Sakunthala to the chef, Bandara, who proudly explains the names and ingredients of some of the more exotic delicacies that are grown on the estate. Every conceivable vegetable and fruit appears, in healthy curries and salads – jackfruit, breadfruit, manioc, snake gourd, papaya, mango, rambutan and tiny sweet bananas. All of these are placed with deliberate care around a large earthenware bowl of Ulpotha’s unique strain of delicious, rare organic red rice. This not only feeds the village and the guests, but is also exported throughout Europe. For several months of the year, this self-sufficient estate and working village becomes a retreat that attracts world-famous yoga teachers. Lessons are conducted in a wooden-pillared pavilion beside either the rice paddy or the lake, and guests can also practise their sun salutations alone, atop a polished boulder or rocky hilltop. And there is so much more than yoga to the Ulpotha experience. There are magnificent walks in the surrounding hills, and rickety old bicycles to take you around the nearby villages or further afield, to even more spectacular lakes for swimming. There is also the wedegedera, or native treatment center, presided over by Senanayake, the wizened medicine man, who will grind up various herbs into pastes to cure ailments from headaches and colds to jet-lag. Lying in a steamer covered in sandalwood paste is an unmissable daily ritual; suspended on a woven mat anchored across two boiling cauldrons of herb-infused water, you stew like dim sum beneath a basket dome. The fact that your ayurvedic cure and your dinner probably grew alongside each other in the garden indicates a simpler approach to looking after the body – a traditional way we have long forgotten in the West. Nature is the cure, and Ulpotha reminds us of a more holistic approach to life and health. Here, you are living according to the natural rhythms and ancient rituals of the land. There is not a fluffy towel in sight, but you leave this hedonist’s Shangri-la feeling as pampered and relaxed as if you had spent a month in a five-star deluxe hotel.